Every family has a skeleton in the closet. The uncle you don’t talk about. The vacation everyone has agreed not to mention. The cousin who has had a run in with the law. But Mortimer Brewster (played by Brendan Massar) is about to discover a closet or in this case a basement full of skeletons in the Lampeter-Strasburg High School Thespian Society’s presentation of Arsenic and Old Lace opening next week. Brendan Massar discovering a dead body (expertly played by Al Williams) hidden in the dining room of his aunts' home. For those unfamiliar with Arsenic and Old Lace here is a brief introduction. Mortimer Brewster has been living a fairy tale. His loving spinster aunts (played by Emily Sidelinger and Ashely Crutcher) fill the role of surrogate mother. He has a dream job as a Broadway critic. He has just gotten engaged to his childhood sweetheart and neighbor (played by Caroline McEligot). Life is perfect. However, Mortimer’s calm reality is about to be shattered when he discovers **Spoiler Alert** his entire family is insane homicidal maniacs. Mortimer always knew his brother, Teddy Brewster (played by Joey Shiffer), was crazy but ultimately harmless. How crazy his Teddy? He thinks he is President Theodore Roosevelt and spends his days digging the Panama Canal in the home's basement. Mortimer's brother Teddy played by Joey Shiffer believes himself to be Teddy Roosevelt. His estranged brother, Jonathan Brewster (played by Sean Burke), who in addition to being a killer might also suffer from body dysmorphic disorder having had numerous plastic surgeries to change his identify performed by the alcoholic Dr. Einstein (played by Braeden Weaver). Jonathan (played by Sean Burke) returns home much to the displeasure of his elderly aunts, played by Ashley Crutcher and Emily Sidelinger. Mortimer's sweet spinster aunts Abby and Martha Brewster are really black widows in disguise killing elderly gentlemen who cross their paths by poisoning them with homemade elderberry wine laced with arsenic. The aunts believe their killing spree to be "charitable acts." With all these new revelations, Mortimer has some difficult decisions to make. Call the police? Cover up the murders? Could he be as crazy as the rest of his family? Mortimer becomes so unhinged he considers calling off his marriage to Elaine Harper (played by Caroline McEligot) out of fear of hurting her. A production of this scale does not happen over night. In fact, Arsenic and Old Lace represents two months of rehearsal and several hundred hours of physical labor. 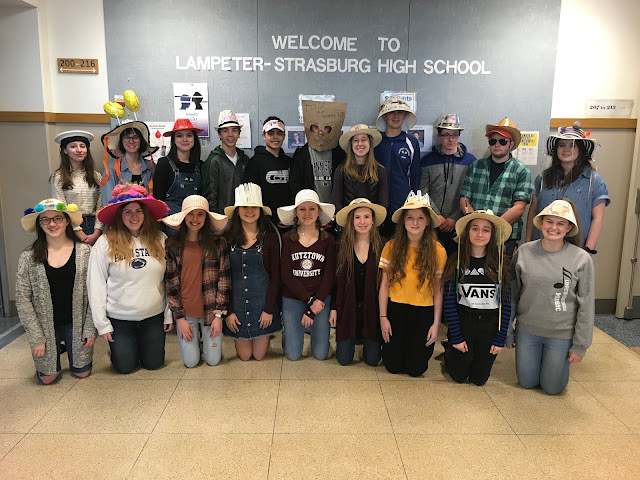 The process began early in the summer when high school English teacher and director Mrs. Susan Rettew started reviewing scripts for the November show. Few people realize that despite Arsenic and Old Lace being written in 1939 by Joseph Kesselring it is still one of the most popular high school play productions today. Once the show is selected and approved the real work (much of which occurs behind the scenes) begins involving the talents of several high school staff members who oversee different aspects of the production. The most visible member is Rettew. She held auditions in the second week of school and announced the cast a few days later on September 1. Rettew not only directs the student cast but also the rest of the production team. Rettew is aided by stage managers Jordanne Brodersen and Nick Blair as well as assistant stage manager Skye Reinacher. The actors under Rettew's direction includes (in order of appearance) Emily Sidelinger, Andrew Lines, Joey Shiffer, Steven Greenwood, Nolan Davidson, Ashely Crutcher, Caroline McElligot, Brendan Massar, Preston Brazzle, Sean Burke, Braeden Weaver, Logan Emmert, Pierson Castor, Ezra Mellinger, and Al Williams. The L-S Performing Arts Center commonly referred to as the PAC is one of the largest in the county. Overseeing the PAC and technical direction of the show including but not limited to sound and lighting is Mr. Patrick Nightingale and his dedicated student tech crew of Josh Mellinger, Ryan Fahnestock, Kristen Mast, Ivy McComsey, Lauren Rettew, and Josiah Zehr. When Rettew asked high school technology education teacher Mr. Adam Zurn if he would be willing to build a two story house on stage he was quick to say yes. What Zurn didn't realize was that doing it would take him about 90 hours to complete. Arsenic and Old Lace is probably the largest fall play production since 2008's Noises Off. Noises Off also required the construction of a two story house. An added challenge was making the entire set mobile. A scheduling conflict had an orchestra concert in the PAC two weeks before opening curtain so the set had to be built on casters so it could be moved for the one night music performance. The set for the fall play took over 200 2x4s, 20 sheets of plywood, and 10 pounds of screws and nails to construct. With the help of Skyler Reese, Ryan Stream, Ryan Fahnestock, and Josh Mellinger, Zurn built the Victorian home complete with a staircase and three functioning doors. Business education teacher and program manager Ms. Michele Meyer is a constant fixture. She advises the Thespian Society helping to organize the students for these large productions as well as create the program. Mortimer has life changing decisions to make. Turn in his aunts to the police? Marry Elaine? How to escape the madness that is being a Brewster? Find out what happens and what Mortimer decides next week at Arsenic and Old Lace when the curtain rises at 7 pm on November 10, 11, and 12 in the LSHS PAC. Tickets are currently on sale in the high school main office and at the door. Read more about Arsenic and Old Lace here. See all of Nick Blair's rehearsal images here.